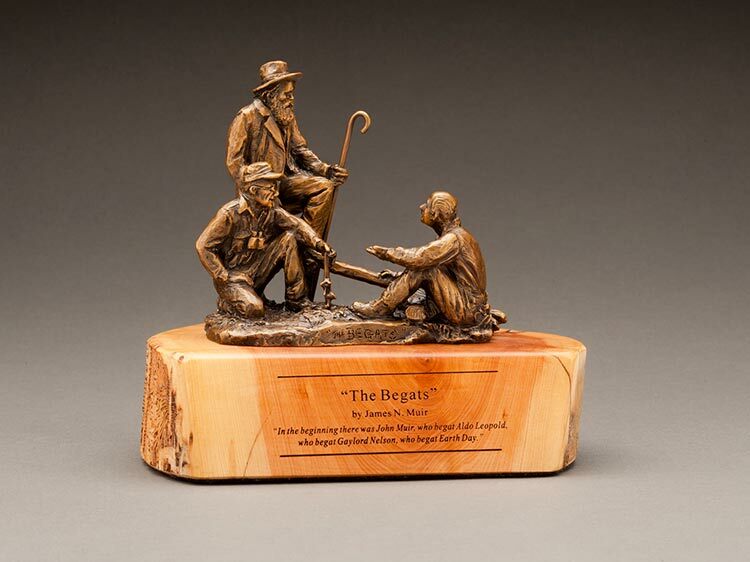 The initial concept involves a “Socratic” – type discussion between John Muir, Aldo Leopold and Gaylord Nelson. Muir is standing above the others, in deference to his status as the “founding father” of ecological and conservation awareness. His ubiquitous walking stick, resembling a staff, reflects his being the good “shepherd”, leading humanity through nature’s wilderness. Nelson is seated, cross-legged, Indian fashion on the ground, right hand upon the fallen tree, to denote “Earth Day”, as well as his being the “offspring” of both Muir and Nelson. All are dressed in the attire most typical of their “working clothes” (this to be more thoroughly researched but photos reflect a possible scenario (eg. Hat, cap with binoculars, and bareheaded respectively). Because of the possibility that they may be going lifesize, I have chosen not to seat them on a bench – too urban, nor on tree stumps – too reflective of commercial exploitation, nor even on a rock – too insensitive to the earth. As depicted, they are standing, knealing and sitting by a beaver-cut tree. This selected portrayal, not only pays homage to the symbiotic relationship of all living things in nature, but also provides a central spot for the viewer to sit/stand and feel like an equal participant in the conversation.